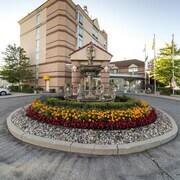 Near the intersection of Hwys 400 and 401, this suburban Toronto hotel offers easy access to Pearson Airport (13 km, 8 mi) and downtown Toronto (20 km, 12 mi); several parks are within walking distance. 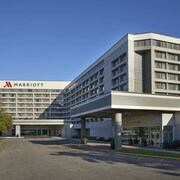 Centrally located, this hotel is across the street from Alexandra Park. 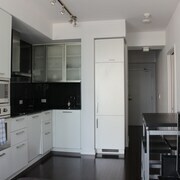 Close to Chinatown and Kensington Market. It is only 1.1 kilometers from the Art Gallery of Ontario. 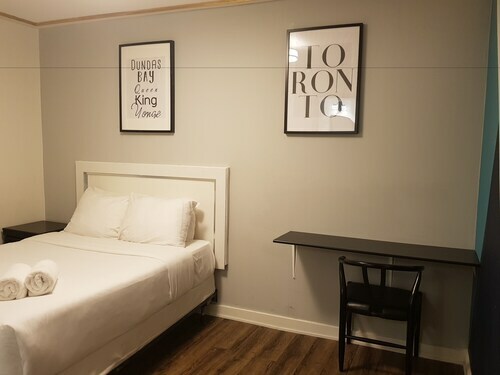 Located in Downtown Toronto, this hotel is within a 10-minute walk of Spadina Avenue Shopping District and University of Toronto - St. George Campus. Royal Ontario Museum and Art Gallery of Ontario are also within 1 mi (2 km). Spadina Station is 9 minutes by foot and Queen's Park Station is 13 minutes. 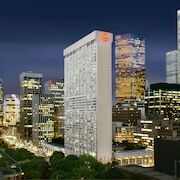 This family-friendly Toronto hotel is located near the airport, within a 10-minute walk of Nathan Phillips Square, Toronto Eaton Centre, and Scotiabank Arena. TIFF Bell Lightbox and Metro Toronto Convention Centre are also within 15 minutes. King Station is only a 4-minute walk and St Andrew Station is 7 minutes. 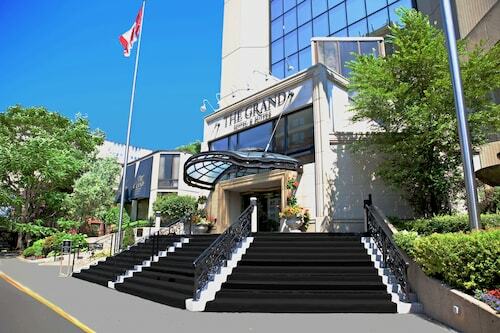 Located in Toronto Entertainment District, this luxury hotel is steps from The Path, Royal Alexandra Theatre, and PATH Underground Shopping Mall. 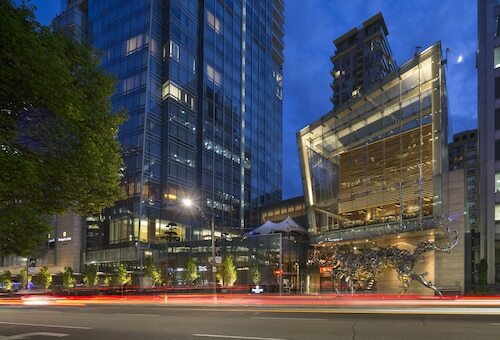 Queen Street and Roy Thomson Hall are also within 5 minutes. 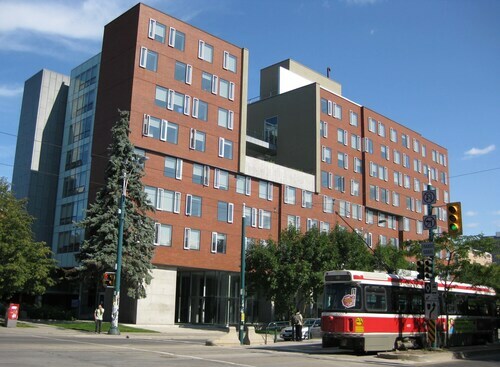 Osgoode Station and St Andrew Station are within a 5-minute walk. 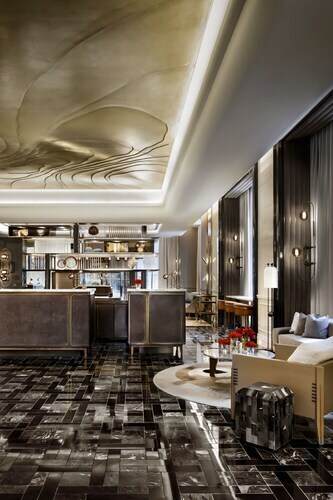 Fashionable Yorkville boutiques, restaurants, and galleries surround the Park Hyatt, the renowned Royal Ontario Museum is right across the street, and downtown Toronto is just 5 km (3 mi) away. How Much is a Hotel Room in Toronto? 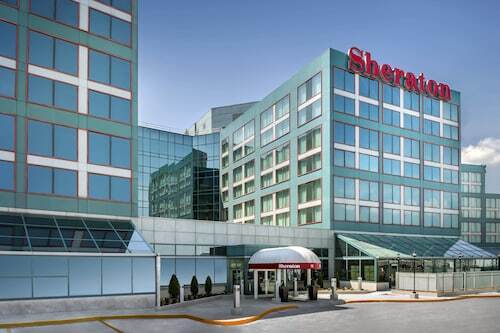 Hotels in Toronto start at C$99 per night. Prices and availability subject to change. Additional terms may apply. Oh, to travel the world. To be surrounded by the tantalizing murmur of foreign languages, to taste unfamiliar spices on the tongue, to take in with all the senses the many ways in which mankind can find joy and create community on this planet. As St. Augustine said, “The world is a book, and those who do not travel read only one page.” But if you have time for only one stop on your next vacation, don’t despair. Head to Toronto, Canada, where a microcosm of the world awaits. Not only is this a major center of Canadian art, music, and literature, but a multicultural hub as well. Foreign cultures thrive in its streets, with their own communities, restaurants, markets, and festivals open to anyone wishing to explore. With more than half of its residents born outside of Canada, Toronto is home to 200 ethnic groups speaking more than 140 distinct languages. 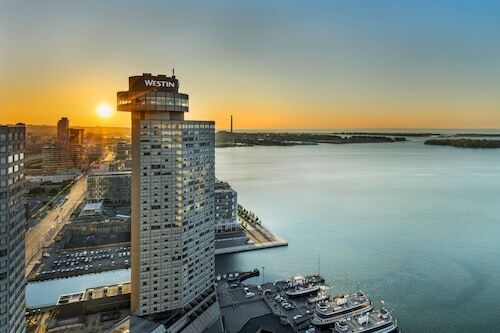 Deciding where to stay in Toronto is like selecting from the best the world has to offer. 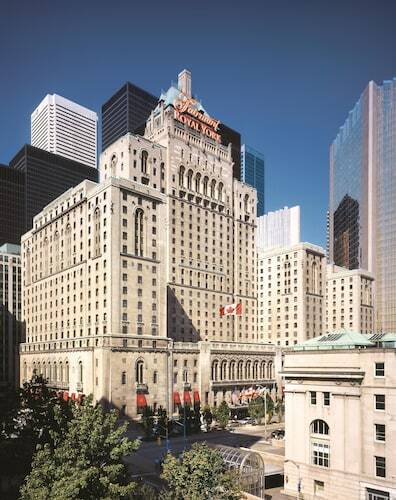 Outside the door of some of the top hotels in Toronto, you can see the best museums in the country, breathtaking parklands, the scent of Italian home cooking, or the sound of scintillating jazz. Whatever your pleasure, Toronto serves it up with that unique Canadian grace. Pool and saunas: Head to the 27th floor and take a dip in the pool that looks out to the CN Tower and the metropolis in full swing below. There’s also a hot tub whirlpool and separate female and male saunas for extra privacy. Playroom: If you brought the children with you on vacation, make a stop at the Kid Centre, which has bunnies and fish you can feed. Food: Need a bite to eat before exploring the city? 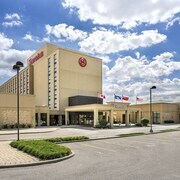 The hotel has four different food options, including a coffee bar, on-the-go market, outdoor garden club, and an upscale restaurant. Gym and pool: Give your body a workout at the 24-hour gym or the indoor lap pool. 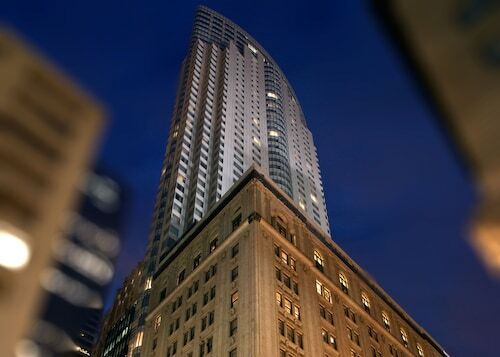 Location: Located on Yonge Street, you’re already on the most popular avenue of the city. Take your time enjoying the pubs, boutiques, and restaurants along the row. Local restaurant delivery: If you’d prefer to stay in your cozy hotel room, the Courtyard offers local restaurant dinner delivery. Food: Prepare yourself for cuisine pretty enough for a magazine spread. 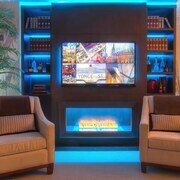 Spa: Treat yourself to the Grand Spa, which offers a hot stone massage you’ve more than earned. You can also sign up for a pedicure, facial, and manicure to feel extra pampered. 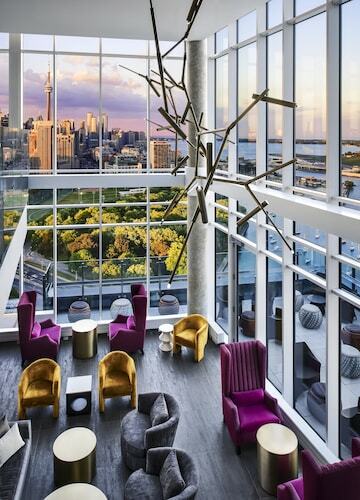 Panoramas and pools: Witness the grandeur of Toronto when you relax on the rooftop patio garden. Or, for views of a different kind, dip your toes into the neo-classical pool and admire the opulence on display. Food: Eat dinner one of hotel’s award-winning restaurants just steps from your room. Pool: Take a dip in the heated indoor pool that’s known just as much for the good swimming as it is for its pretty architecture. When you’re ready to experience Toronto for yourself, jump right in. 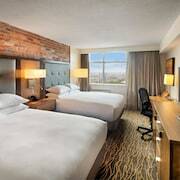 With Travelocity’s deals on cheap hotels in Toronto, you can pick and choose the accommodations that fit your needs. Make this the vacation you’ve always wanted. 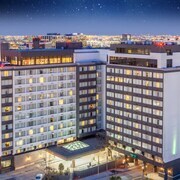 The Radisson is perfectly located at several different restaurants, as well as the streetcar that takes you to the subway station. 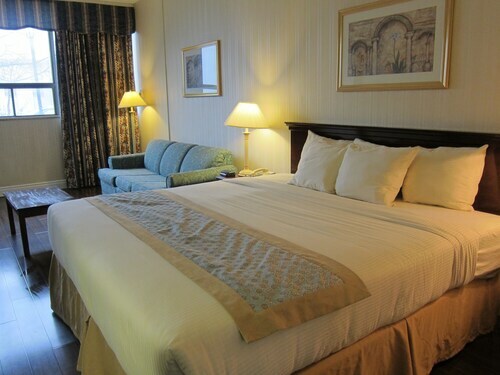 The staff are friendly, warm and welcoming and the rooms are beautiful and clean.